Steering angle (left/right): 35 deg. / 35 deg. Curb Mass includes all necessary materials and fluids to operate correctly, full tank of fuel (more than 90% of capacity) and tool kit (if supplied) Power / Torque figures measured at the crankshaft. The specifications mentioned here apply to and have been achieved by production models under standard operating conditions. We intend only to give a fair description of the vehicle and its performance capabilities but these specifications may not apply to every machine supplied for sale. 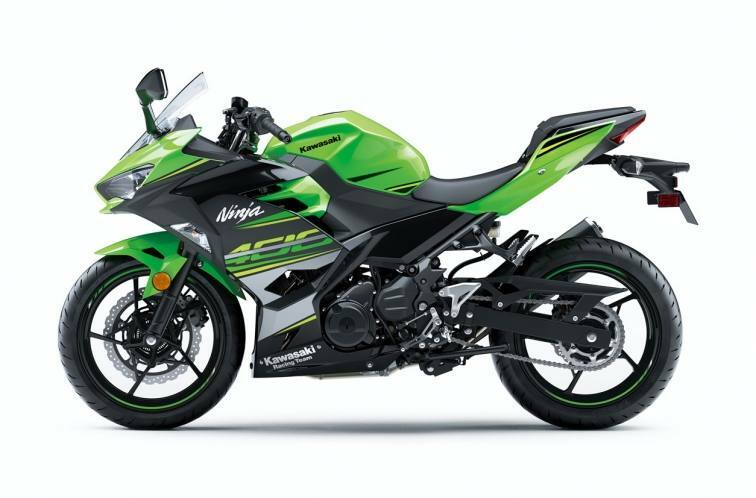 Kawasaki Heavy Industries, Ltd. reserves the right to alter specifications without prior notice. Equipment illustrated and specifications may vary to meet individual markets. Available colours may vary by market. 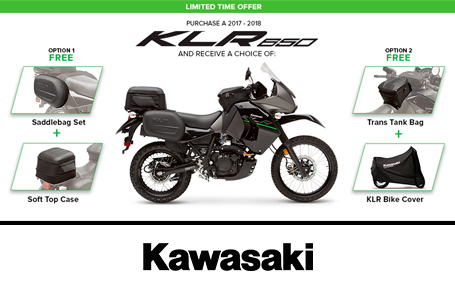 Purchase a select KLR650 and receive a Free Touring Kit. 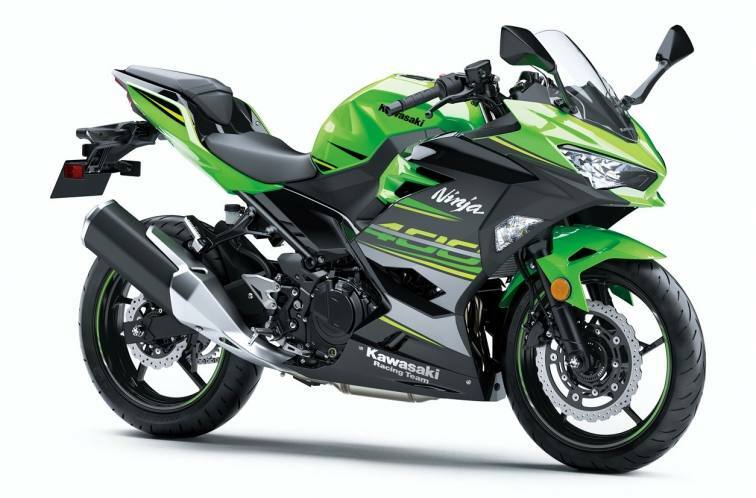 Available on certain KLR650 models at participating dealers. Some conditions apply. 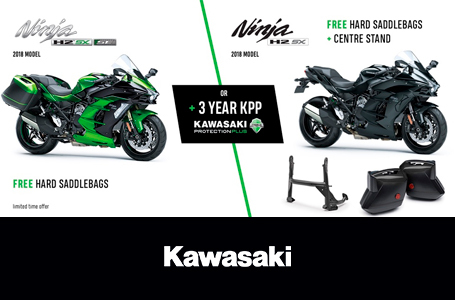 Purchase a select new Ninja H2 SX SE and receive hard saddlebags free. 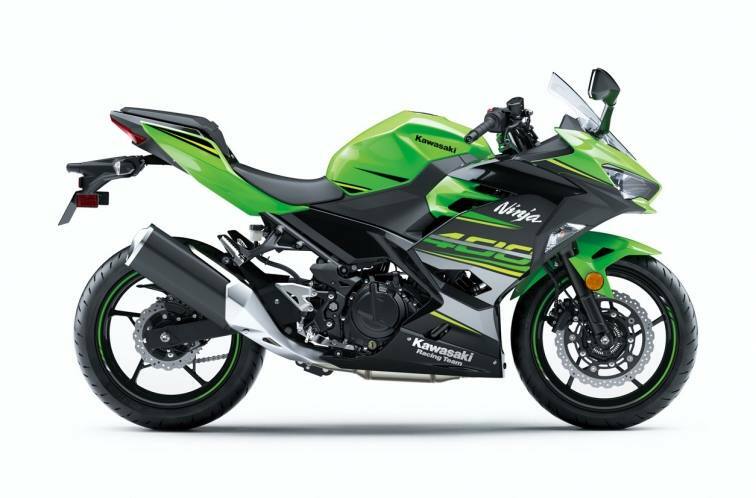 Or purchase a select new H2 SX (standard model) and receive hard saddlebags and a center stand free.